Be confident your Glock pistol will perform to factory standards each and every time with genuine Glock factory magazines. Manufactured to Glock specifications in Austria by Glock. All models include round count indicator on rear face of magazine body and standard factory baseplate. GLOCK is a federally registered trademark of Glock, Inc. and is one of many trademarks owned by Glock, Inc. or Glock Ges.m.b.H. SkyArms is an independent dealer of parts and accessories for Glock pistols, and is not affiliated with or endorsed by Glock, Inc. or Glock Ges.m.b.H. 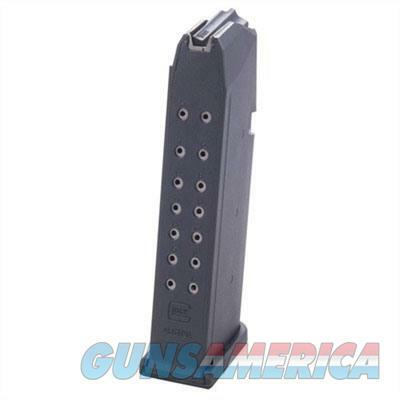 The use of Glock on this page is merely to advertise the sale of Glock parts or components. As indicated in the product descriptions, not all parts and accessories on this site are official Glock products.